or click here to view a labelled image. 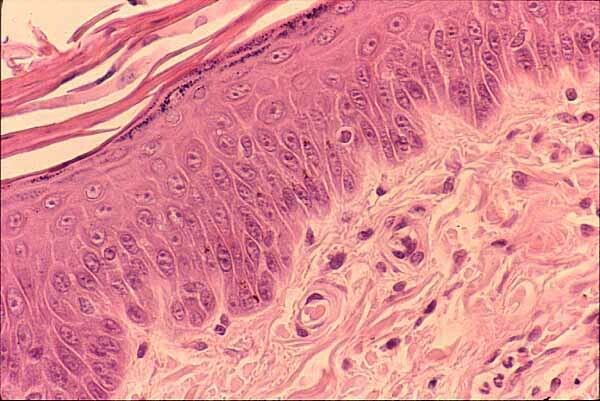 This image shows the stratified squamous epithelium that comprises the epidermis, overlying the fibrous connective tissue that comprises the dermis. The epidermis consists primarily of keratinocytes, the cells which accumulate keratin as they mature and migrate toward the surface, eventually becoming the tough, dead outer layer (stratum corneum) of the skin. Epidermis also includes scattered cells of other types, melanocytes, Langerhans cells, and Merkel cells. One of these other cells, probably a melanocyte, is clearly visible to the right of the upper center in this image. The dermis consists primarily of extracellular collagen fibers and ground substance. Scattered within this matrix are individual cells. In this H&E stained specimen, collagen appears pink while ground substance is unstained (i.e., the pale background color). The very dark purple (nearly black) spots are cell nuclei. In this location, most of the nuclei belong to fibroblasts. Some may also belong to macrophages, mast cells, or capillary endothelial cells. The group of odd-shaped nuclei near the lower right corner belong to neutrophils within a small venule. Click here to view a labelled image.